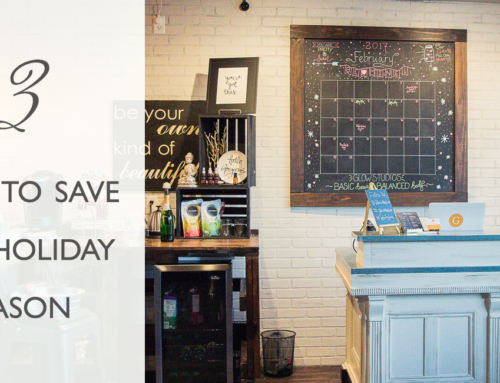 Roots To Rise is a Northern Virginia, local business producing healthy, plant-based, vegan, cold-pressed juices to our area. 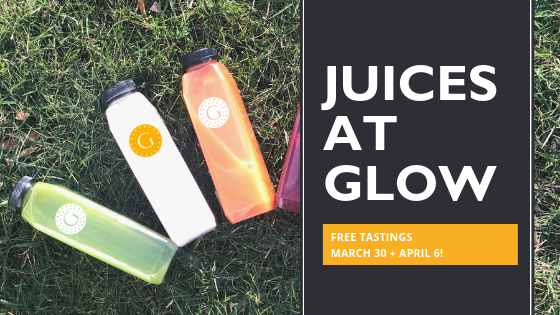 With a cornucopia of fresh ingredients and health benefits, Roots To Rise juices and mylks were created “to provide you with a taste of pure nature, a moment to enjoy it and an opportunity to pay it forward.” Beginning April 1, GLOWstudios is opening its doors and welcoming Roots To Rise juices for all GLOWgetters. 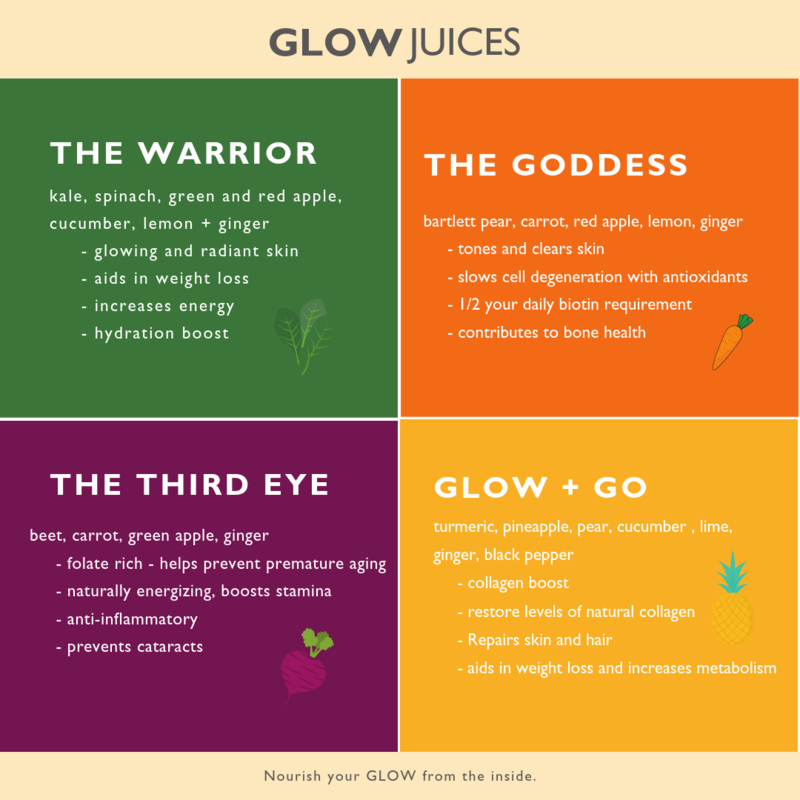 We invite you to begin GLOWing from the inside, with a variety of Juice flavored options, and begin your journey to a healthier you. The idea of juicing is not new, it can be dated back to 150 B.C. During this time, the Dead Sea Scrolls describes men mashing pomegranates and figs, along with other fruits and vegetables to extract their nutrients and juices for health benefits. As we evolved so did the way we juice. The first commercial juicer, the Norwalk Juicer, was invented by Dr. Norman Walker, in the 1930’s. He lived to be over a 100 years old; one could say he invented The Fountain of Youth. The 1990’s brought us the first Juicing Infomercial by Jay Kordich, the Father of Juicing….now juicers are a common, kitchen, household item and healthy way of life. It’s as simple as masticating vs. centrifugal. No? Well, how about slow-speed juicing vs. high-speed juicing. Roots To Rise uses the method of masticating. This slower speed of juicing produces less heat unlike, centrifugal juicing. Heat affects enzymes, nutrients and even quality of taste thus resulting in a less nutritional and slightly-less impactful taste; aka a store bought juice. That old life long lesson of Slow and Steady Wins the Race rings true, when it comes to the quality of your juices. 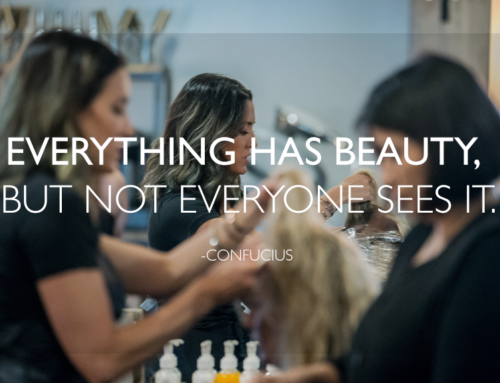 When you support local, you are paying it forward in your community. 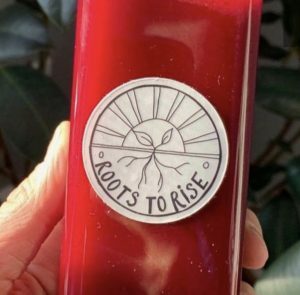 Just as GLOWstudios supports Roots To Rise; Roots to Rise juices are created with the help of produce from local farmers. 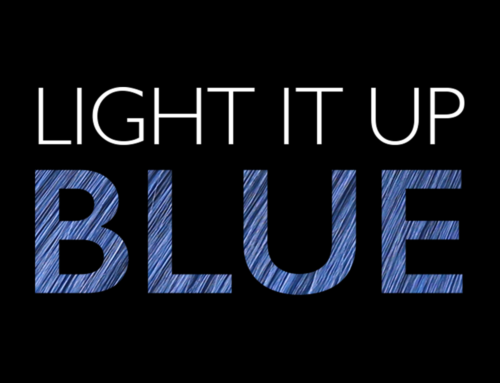 Plus, with each purchase, Roots to Rise gives back to feed insecure families, in our community. And thus the supportive circle of our community in Loudoun County grows. A new signature juice is in town, specifically created for GLOWstudios. The GLOW and go is made with pineapple, bartlett pear, cucumber, lime, ginger, tumeric and black pepper. 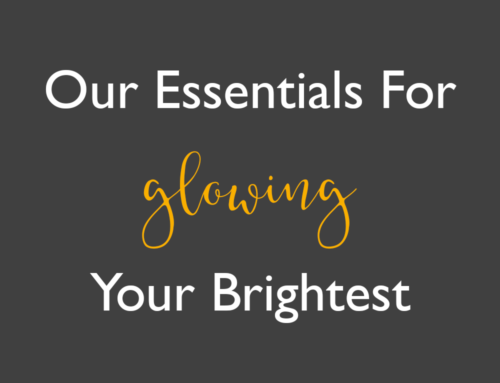 GLOWgetters receiving face and body treatments will wrap their service up with a 4oz. GLOW and go. A 12oz. is, also, available for purchase.